YOUBETCHA is the 5yo son of 10 Time Group 1 winner SO YOU THINK, sire of talent such as G1 winners D'ARGENTO, INFERENCE, SOPRESSA and LA BELLA DIOSA. He has 3 Wins 1219m to 1396m, and 4 Seconds 1350m to 1600m from 28 starts with earnings of $42,075 and does his best when racing close to the speed as shown with all his wins and placings. Youbetcha defeated Dark Image who has since relocated to NSW and has won over $40,000.00 for his new connections. He was recently sold, but hasn't settled into his new environment. His Trainer can't put his finger on what his issue is and Owners are now becoming frustrated. He would benefit from a change of scenery. For more information please contact Royal Bloodstock. SO YOU THINK (NZ) (Bay or Brown 2006-Stud 2012). 14 wins-1 at 2, MVRC WS Cox P., Gr.1-twice. Sire of 387 rnrs, 217 wnrs, 15 SW, inc. La Bella Diosa (New Zealand One Thousand Guineas, Gr.1), Nakeeta Jane, Sopressa, D'Argento, Inference, Gold Rush, Heavenly Thought, Higher Ground, Think Bleue, The Pinnacle, Northwest Passage, Global Thinking, Marathon Man, Care to Think, So Si Bon, SP Harvestfortheworld, Light Up the Room, Coral Coast, etc. Youbetcha (g. by So You Think). 3 wins. See below. SAMBRO (Fastnet Rock). 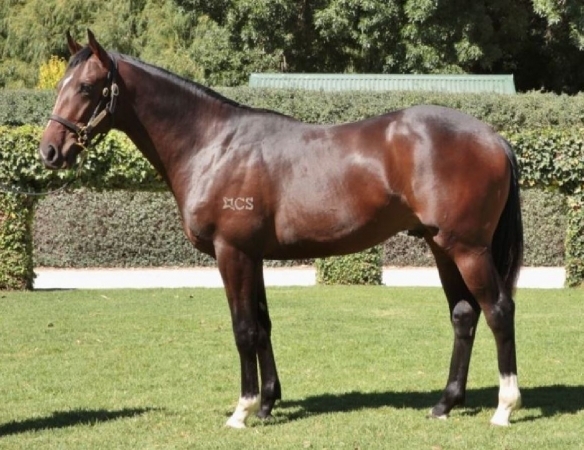 3 wins-1 at 2-at 1400m, 1600m, A$710,332, to 2017-18, BRC Queensland Guineas, Gr.2, Hawkesbury Guineas, Gr.3, ATC TAB Rewards 2YO H., 2d VRC Carbine Club S., Gr.3, GCTC Magic Millions Cup, RL, ATC Filante H., TAB H., Pluck at Vinery H., 3d ATC Dulcify H., L, Seven News 2YO P., 4th ATC Villiers H., Gr.2. NOTHINGILIKEMORE (Husson). 6 wins from 1200m to 1600m, HK$12,408,150, to 2017-18, Hong Kong Classic Mile, L, HKJC Power of Music H., Parmigiani Excellent H., Tak Ku Ling H., Geranium H.
BACHMAN (All American). 4 wins-2 at 2-to 1400m, A$436,410, ATC Schweppervescence H., Gr.3, GCTC Goldmarket H., L, ATC Inglis Premier in March H., 2d BRC Queensland Guineas, Gr.2, 3d ATC Maurice McCarten S., Gr.3, Hawkesbury Guineas, Gr.3, Dulcify H., L.
STEPITUP (Hussonet). Horse of the Year & Champion Older Horse in Singapore in 2015. Champion 3YO in Singapore in 2013. 15 wins from 1000m to 2000m, S$2,467,107, Singapore 3YO Sprint, L, Singapore TC Kranji Mile, L, Raffles Cup, L, Queen Elizabeth II Cup, L, Chairman's Trophy, L.
BONS AWAY (Bon Hoffa). 6 wins at 1000m, 1200m, A$453,790, to 2018-19, MRC WJ Adams S., L, Testa Rossa S., L, 2d VRC TAB S., Gr.2, 3d VRC Gilgai S., Gr.2, MRC Caulfield Sprint H., Gr.2. Race Record: 28 Starts 3-4-0 A$42,075. 3 wins to 1400m to 2017-18 in Aust. (11.0) SAJC Hughes Chauffeured Limousines Maiden 2YO P., A$34,000, 1000m, time 1:00.68. Track soft(6). Carried 57.50kg. Ashero was 1st and Don't Cry Wolf 2nd and Arizona Wildcat 3rd. Trainer: L Macdonald & A Gluyas. Owner: B L Lange, Mrs S M Lange, B Lange,p J Lange, Mrs S E Tregoning, Mrs G E M Bah, N V Lange, Mrs N Myers, Dj Myers, J J Bayer, Mrs A M Bayer, W Gill, Mrs G Johnston, J Gill, Miss M G. Jockey: Ms C Lindop. (11.6) Murray Bridge RC Carlton Draught 2YO Maiden P., A$17,300, 1006m, time 1:01.73. Track soft(7). Carried 57.50kg. Nodoubtaboutit was 1st and French Rock 2nd and Ripping Effort 3rd. Trainer: L Macdonald & A Gluyas. Owner: B L Lange, Mrs S M Lange, B Lange,p J Lange, Mrs S E Tregoning, Mrs G E M Bah, N V Lange, Mrs N Myers, Dj Myers, J J Bayer, Mrs A M Bayer, W Gill, Mrs G Johnston, J Gill, Miss M G. Jockey: Ms C Lindop. (14.8) Gawler & Barossa JC Akeed Mofeed at Goldin Farms Maiden P., A$13,800, 1204m, time 1:14.17. Track soft(6). Carried 57.50kg. Ghenwaa was 1st and Breaker of Chains 2nd and Rancho Relaxo 3rd. Trainer: L Macdonald & A Gluyas. Owner: B L Lange, Mrs S M Lange, B Lange,p J Lange, Mrs S E Tregoning, Mrs G E M Bah, N V Lange, Mrs N Myers, Dj Myers, J J Bayer, Mrs A M Bayer, W Gill, Mrs G Johnston, J Gill, Miss M Gi. Jockey: B Claridge. (10.1) Balaklava RC Bardrill Maiden P., A$17,300, 1400m, time 1:21.63. Track heavy(9). Carried 56.00kg. Breaker of Chains was 1st and Toyshop 2nd and Roselli Sting 3rd. Trainer: L Macdonald & A Gluyas. Owner: B L Lange, Mrs S M Lange, B Lange,p J Lange, Mrs S E Tregoning, Mrs G E M Bah, N V Lange, Mrs N Myers, Dj Myers, J J Bayer, Mrs A M Bayer, W Gill, Mrs G Johnston, J Gill, Miss M Gi. Jockey: Ms C Lindop. (5.4) Strathalbyn RC Lion Nathan Group Maiden P., A$12,000, 1203m, time 1:15.96. Track good(4). Carried 57.00kg. Let's Tango was 1st and Never Without You 2nd and Iron Max 3rd. Trainer: L Macdonald & A Gluyas. Owner: B L Lange, Mrs S M Lange, B Lange,p J Lange, Mrs S E Tregoning, Mrs G E M Bah, N V Lange, Mrs N Myers, Dj Myers, J J Bayer, Mrs A M Bayer, W Gill, Mrs G Johnston, J Gill, Miss M Gi. Jockey: Ms C Lindop. (8.3) SAJC Adelaide Cup Raceday Maiden P., A$12,000, 1400m, time 1:24.77. Track good(3). Carried 55.00kg (allowance -2.00kg). Table of Wisdom was 1st and Touch 2nd and Clever Tommy 3rd. Trainer: L Macdonald & A Gluyas. Owner: B L Lange, Mrs S M Lange, B Lange,p J Lange, Mrs S E Tregoning, Mrs G E M Bah, N V Lange, Mrs N Myers, Dj Myers, J J Bayer, Mrs A M Bayer, W Gill, Mrs G Johnston, J Gill, Miss M Gi. Jockey: Eran Boyd. (6.9) Strathalbyn RC High Street Trading H., A$15,000, 1600m, time 1:41.64. Track soft(5). Carried 57.00kg. Dances on Stars was 1st and Jet Express 2nd and Miss Murra 3rd. Trainer: L Macdonald & A Gluyas. Owner: B L Lange, Mrs S M Lange, B Lange,p J Lange, Mrs S E Tregoning, Mrs G E M Bah, N V Lange, Mrs N Myers, Dj Myers, J J Bayer, Mrs A M Bayer, W Gill, Mrs G Johnston, J Gill, Miss M Gi. Jockey: Ms C Lindop. (8.0) Gawler & Barossa JC Ubet Anzac Appeal H., A$15,000, 1100m, time 1:06.09. Track good(4). Carried 58.50kg. Just a Bigger Dash was 1st and On Appro 2nd and Rosie Louise 3rd. Trainer: L Macdonald & A Gluyas. Owner: B L Lange, Mrs S M Lange, B Lange,p J Lange, Mrs S E Tregoning, Mrs G E M Bah, N V Lange, Mrs N Myers, Dj Myers, J J Bayer, Mrs A M Bayer, W Gill, Mrs G Johnston, J Gill, Miss M Gi. Jockey: Ms C Lindop. (11.3) Strathalbyn RC S Montgomerie & C Forrest H., A$15,000, 1362m, time 1:23.96. Track soft(6). Carried 58.50kg. With Gravy was 1st and Archway to Heaven 2nd and First Draft 3rd. Trainer: L Macdonald & A Gluyas. Owner: B L Lange, Mrs S M Lange, B Lange,p J Lange, Mrs S E Tregoning, Mrs G E M Bah, N V Lange, Mrs N Myers, Dj Myers, J J Bayer, Mrs A M Bayer, W Gill, Mrs G Johnston, J Gill, Miss M Gi. Jockey: Raquel Clark. (44.1) Wodonga TC Premier Building & Construction H., A$35,000, 1200m, time 1:11.63. Track good(4). Carried 58.00kg. Camila Lucinda was 1st and Booradley 2nd and Pieceofeight 3rd. Trainer: P McVicar. Owner: Ms R J Tatham. Jockey: Liam Riordan. (12.7) Albury RC Border Bandag H., A$22,000, 1175m, time 1:10.32. Track good(4). Carried 58.50kg. Pacific Tycoon was 1st and Wrecking Ball 2nd and Landmine 3rd. Trainer: P McVicar. Owner: Ms R J Tatham. Jockey: M Travers.